A little digging leads to some insight into the enigmatic author who spent summers cooking in a cottage in Edgecomb. EDGECOMB — When cookbook author and culinary educator Lily Wallace bought the Edgecomb property where she would build her summer home in 1922, she surely sought what other seasonal residents on rural Cross Point Road were after: fresh air, a swing on the front porch with a view of the Sheepscot River, a respite from her busy life in Brooklyn. And privacy. Wallace’s name was known to many homemakers across the United States in the first half of the 20th century, for her cookbooks, her business savvy and her work as an editor at Woman’s World magazine. 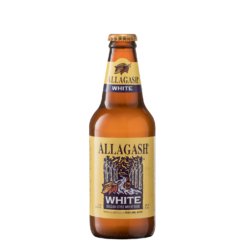 But within the stories that make up Maine’s food history or the tales of celebrated summer people, Wallace’s name does not appear. Perhaps that’s just what she intended. Wallace is so little known here today that Don Lindgren, an expert in antique cookbooks as well as those by Maine writers, thought she might not even be real. It wasn’t unusual, after all, for American food companies in her day to dream up a persona – Betty Crocker, for example – to help sell their products. An email arrived in my inbox the day that essay was published from Cara Gaffney. The subject line made me gasp: “Our home is Lily H. Wallace summer home” – with a smiley face emoji. Wallace was real. Not only that, but she had spent summers cooking in an Edgecomb cottage that lacked electricity or running water, where a wood-fired oven sat in front of a fieldstone fireplace in a kitchen hung with cooking tools. Gaffney and her husband, Michael, moved from Portland and bought the home in 2005, attracted by the cozy cottage feel and its view of the river. The house had been updated and winterized, mostly, and they began adding their own touches, with antique light fixtures and doors, a fleur-de-lis trim on the front porch, and hashmarks tracking the growth of their two sons on a bedroom doorjamb. From the small shed of a boathouse, they launched their candle-making business, Seawicks, which now supplies L.L. Bean, Seabags and about 300 others sellers. 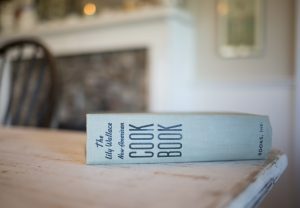 Lily H. Wallace’s “New American Cook Book” on Cara Gaffney’s dining room table. Gaffney immediately began researching the history of the home. The deed on file in Lincoln County listed Lily H. Wallace as the owner, and Gaffney learned from neighbors that she was British and had been a famous cookbook author. She began collecting Wallace’s books and found a few more records through Ancestry.com: a citizenship certificate for “Lillie Haxworth” from 1902, Census records from 1910 and 1925, a ship’s manifest showing she traveled home to the United States from Liverpool in 1912. The more Gaffney searched, the more puzzled she became about why there was so little information on Wallace’s personal life and absolutely nothing in the historical record about her time spent in Maine. When I called Don Lindgren, who deals in rare cookbooks at Rabelais in Biddeford, to tell him what I’d learned about Wallace’s tie to Maine, he was intrigued. Lindgren began his own research, while I called around. The Maine Historical Society had no records related to Wallace. Nor did the Maine Women Writers Collection at the University of New England. Maine food historian Sandy Oliver was not familiar with Wallace. Marylène Altieri, curator of books at Harvard’s Schlesinger Library on the History of Women in America, knew of Wallace’s books but couldn’t at first find much about her life. She enlisted the help of another researcher who found three newspaper clippings, including Wallace’s 1952 obituary in the New York Times. The obituary listed her many successful cookbooks, her studies at the National Training College of Cookery in London, her teaching at the Ballard School for practical nursing in New York, the 17 printings her cookbook “Just for Two” enjoyed, and the 16 years she was homemaking editor of Woman’s World magazine. She was active with various homemaking and Episcopal organizations. And she was the widow of George Wallace. No mention of Maine. Gaffney has a theory, though it’s only that. When she saw that only Wallace’s name was listed on the property’s deed – and not her husband’s – she began wondering whether Wallace might have been gay. The summer house could have been a retreat for her, and maybe a companion. 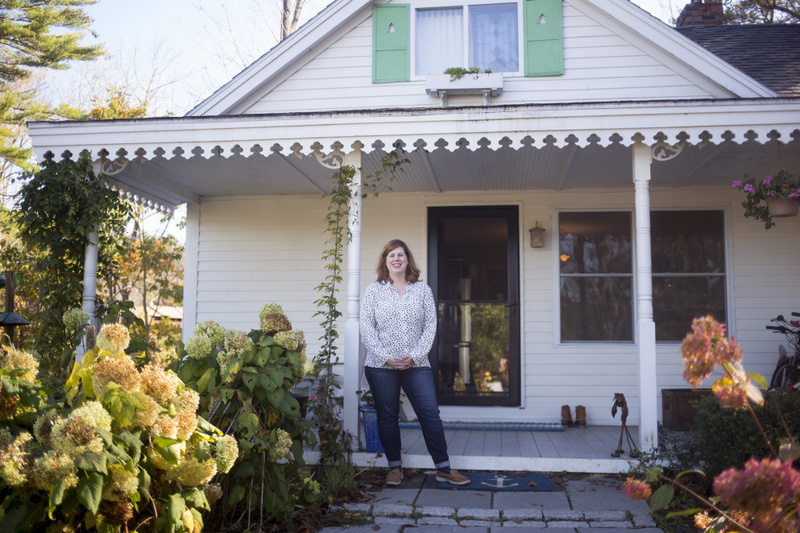 It wouldn’t have been so unusual, said Connie Chase Wells, whose family first settled in the late 1700s on Cross Point Road, where homes at either end were built by her great-grandfather and her great-great-grandfather, both sea captains. In a small town like Edgecomb, she said, neighbors both cared for each other and minded their own business. She recalled that two women summered together in a home just down the road from Wallace’s cottage. 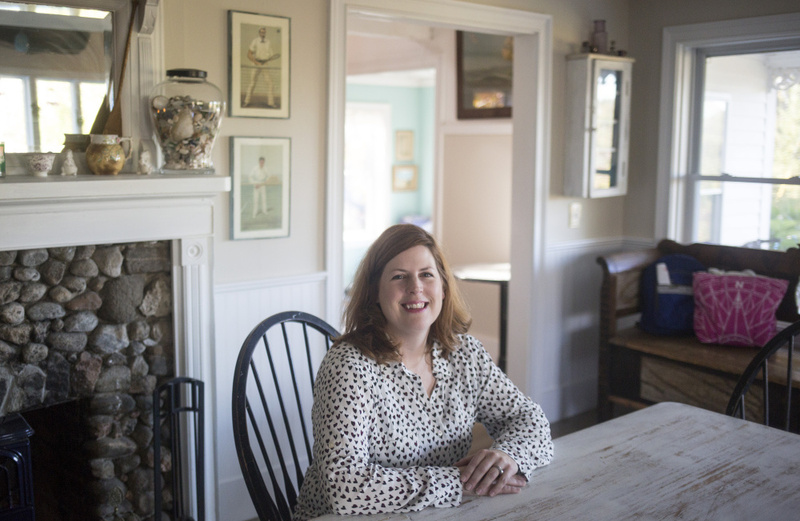 Cara Gaffney in the dining area of her Edgecomb home, originally owned by cookbook author Lily Wallace. Chase Wells remembers meeting Wallace just once when she was a young girl. She and her mother brought fir tips to Wallace for making scented pillows and then stayed for tea. She figures she wasn’t much interested in Wallace then. But she thinks her mother may have wanted her to see Wallace as an example. And Wallace would have been quite a model. After we spoke, Lindgren compiled a timeline of Wallace’s publications, starting with a booklet dated 1900, and continuing through at least 1963, 11 years after her death. He said he saw her as part of a lineage of educators, lecturers and cookbook writers, women who took the roles that society had ascribed to their gender and used them to carve paths for themselves – and for other women – as successful and independent businesspeople. For decades, Wallace wrote and updated “The Rumford Complete Cook Book,” published by the New England company that made Rumford baking powder. 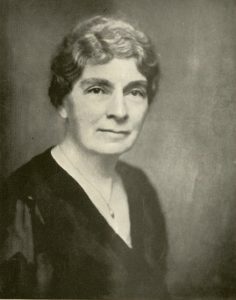 She co-authored early versions of that book with celebrated Bostonian Fannie Farmer, and she shared credit on other books with Mildred Maddocks, founder of the Good Housekeeping Institute; and Janet McKenzie, editor of American Cookery magazine. 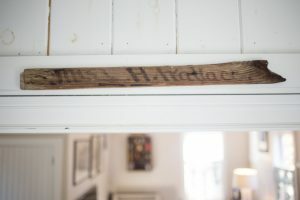 A wooden board with Wallace’s name written on it hangs above the office in Gaffney’s home. Gaffney surmises that the board is from a shipping crate and was later used to frame the windows of the boathouse on the property. 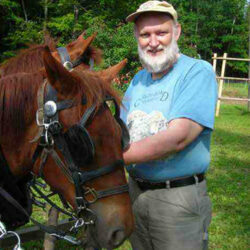 Farmer attained the most fame in that category as the leading voice for a scientific approach to cooking. The way Gaffney sees it, maybe there was room for just one such cookbook author in our collective memory. Lindgren has spent a decade building a collection of more than 300 books about Maine food, called Maine Food in Print, largely made up of modern single-author and tourist-driven books and older community cookbooks compiled for church fundraisers and by groups of townswomen. He plans to add Wallace’s works. In 1945, Wallace sold her home to Dorothy Evelyn Crozier (who was also married, to Edwin, though his name was not included on the deed), retaining the right to lifetime use. In her will, on file in Lincoln County, Wallace gave $5,000, a chest of sterling table silver, “my seed-pearl ring with grandfather’s hair,” and future royalties on her books to a nephew living in Exeter, England. The contents of her home in Edgecomb and the remainder of her possessions in Brooklyn, “including china and tableware,” went to Crozier, whose relation to Wallace is listed only as executrix of her will. Wallace died in 1952 at age 81. Two years later, Crozier sold the Edgecomb cottage to the family of a boy Wallace had once hired to haul water from the well outside and wood to the kitchen. Gaffney likes to cook in Wallace’s kitchen, comfort food mostly, though she hasn’t ever cooked from Wallace’s books. She may start. 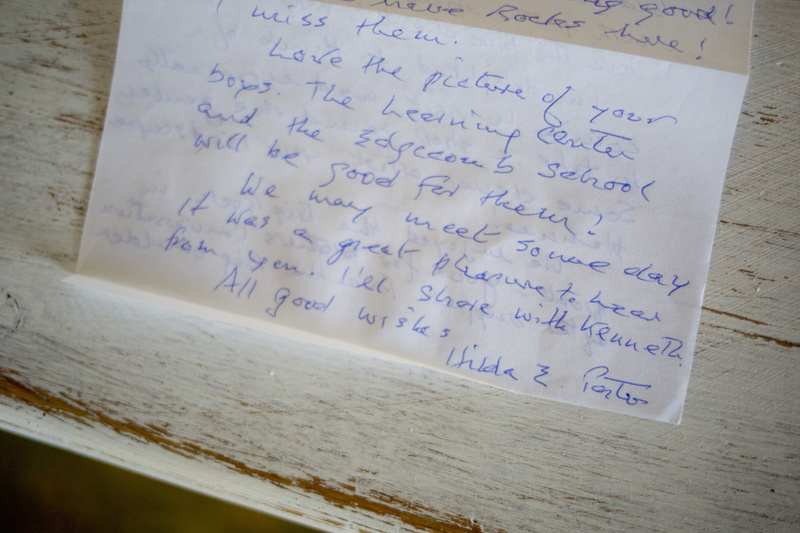 A letter from Hilda Porter to Gaffney. Porter lived in the home before Gaffney, and Porter’s husband worked for Wallace. Lily Wallace’s recipe for chicken pot pie (today, we’d probably call this Chicken with Dumplings) starts with directions on how to dress the chicken, including chopping off the head. We’ve omitted that step here, assuming your chicken has already been dressed. We’ve also edited the recipe, applying some guesswork, as the directions weren’t entirely clear for the 21st century cook. Wallace published the recipe in her “New American Cook Book,” 1946 edition. Put the chicken in a large saucepan, cover with hot water, and bring to a boil. Cover and let simmer until the chicken is tender. Remove the chicken, and when it’s sufficiently cool, take the meat from the bones and cut into bite-size pieces. Return the chicken to the pot, discarding the skin and bones. Add the potatoes, 1 teaspoon salt, and pepper, and continue to simmer. While the mixture simmers, make the dumplings: sift 2 cups flour, the salt and baking powder together. Rub in the shortening with a knife or use your finger tips, until they are roughly pea-sized. Add the milk to make a soft dough. Do not overmix. 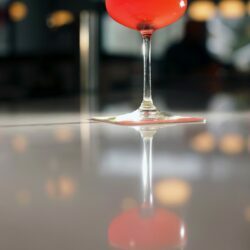 Drop the dumpling dough on top of the simmering chicken in the last 15 to 20 minutes of cooking, 1 tablespoon at a time. Cover tightly and cook until dumplings are light. The cover must not be removed during cooking. Remove the chicken, potatoes, and dumplings to warm bowls for serving. Melt butter and mix with the remaining 2 tablespoons flour to form a smooth paste (or roux). Add to the cooking liquid in the pot and bring to a boil. Serve as a thin gravy.